Distinct Toll Free Number and Your Personal Greeting! Choose your personal, exclusive toll free number with on-line signup. You can record your own personalized greeting for callers along with audio tours for each of your property listings using your extension numbers. Lead the marketplace with high-tech, and use this tool to sell more properties, obtain more listings. Captures ANI Caller ID automatically - Immediate Text Notifications - Daily Activity Reports! Automatic number identification (ANI) provides you with immediate access to the name and phone number of all callers. You can choose to receive an immediate Text Message and email with the caller's name and phone number while they are still listening to your home audio tour . . . it's all included, no hidden fees. Your callers can be transferred to any phone number of your choice for immediate opportunity to speak with you direct . . . get them while they're hot. Callers can choose to speak with you immediately after listening to your home audio tour or recorded message - make that appointment now. When callers leave you a message, you may listen to your messages immediately or at your convenience simply by opening your email. Also you can choose to receive immediate telephone notification from HotlineAmerica which will play the message for you. Of course, you can also retrieve your messages anytime by dialing your toll free number . . . everything is included, never any extra fees. Send Text Messages to callers with instant click links to your website & photos! You can automatically send callers a link to any of your web pages so that callers can view your web site, your photos, videos, maps, etc. simultaneously while the caller is speaking with you . . . yes, it's all included. Text-to-Speech option, NO NEED TO RECORD, you can just type! It is always your option. You may record in your own voice or simply type your personalized greeting and property audio tours, and our text-to-speech voices will speak to callers in your choice of a male or female voice . . . everything is included, there are never any extra fees for any of our features. 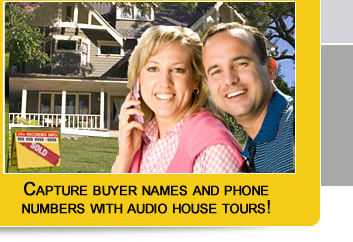 Unlimited Recording Time for property audio tours or recorded messages! You can use separate extensions for each of your listed properties. Tell the world in full detail with crystal clarity about each of your property listings while promoting your services, your skills and experience, special offers to buyers and sellers, etc. . . . it's unlimited. Unique Extensions will track your advertising results! Now you can identify which of your advertising shows the best results by assigning a different extension number to newspaper listings, home buyer magazines, etc. Our reports (all included) detail for you all calls for each of your advertising media. Fax Documents and coupons automatically to callers! You can make available MLS listings, floor plans, brochures, and discount coupons for callers to receive by fax. Give them something tangible. Callers can simply enter their fax number and we'll fax it out for you. Again, it's all included, never any extra fees . . . use technology to build relationships, get more listings, and make more sales. Easy Promotions, you can even charge sponsors a fee! Do you have a relationship with a mortgage company or title/escrow company? How about a home repair contractor, etc.? Typically they will pay you a monthly fee if you will mention them on your recordings. You can turn a profit with sponsor relationships. Also great for lease and rental properties, Mortgage Professionals . . . or any business! Let interested callers know the square footage, the number of rooms, and all the attractive details. Mortgage professionals will often partner with realtors to promote their services and capture leads. Any business which has the need to offer information to callers and capture leads while using state of the art technology can use HotlineAmerica to generate more sales . . . dominate your market. This is your 24/7 Open House! 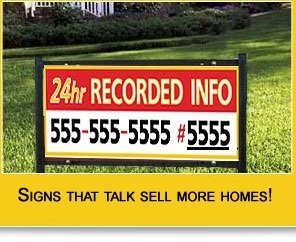 Display to buyers and sellers that you are always on the job. 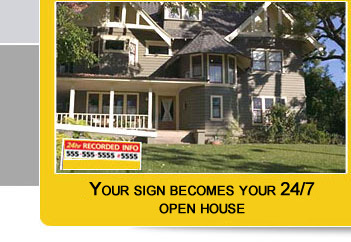 Make the attractive details about your listings, and information about your services available to callers 24 hours around the clock. Your message is always working, even when you're not . . . you get a constant flow of leads of buyers and sellers.